Do you ever go to the store and get out of the car and the first smell is the chicken from the deli? I love the store’s Rotisserie Chicken, but I thought if the store can make it, I can to. Not only was it easy but it was so delicious ,needed to have 2nds. After slicing and cutting veggies, add veggies to bottom of crock pot. Mix the spices together and place some of the spice mixture into the cavity of the chicken. 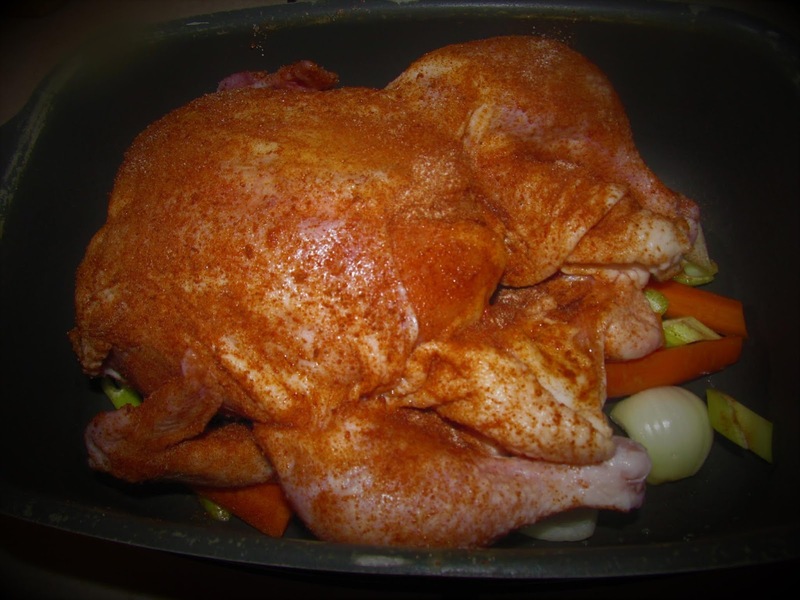 Lift up the skin on the chicken and rub the meat with the spice mixture. Next rub all sides with the mixure until it looks like above. Place into crock pot on top of veggies and cover tightly with lid and set to medium for 3-4 hours. My family loves eating my roast chicken. Guess what we had for dinner last night? That is a great recipe. I have booked marked this for a future try. Thanks for sharing. I do this is the oven. Thank you for providing me with a dinner idea. I will have to try it that way.